My life is slowly going back to normal, I hope, but I’m still behind with drawings so I’ll probably continue to be a little quiet. You guys got tired of this scene too, huh? I guess I overdid it a little. I knew it was going to be a drag, especially when it’s a heated discussion and only one page per week, but in the end, I decided that this is exactly how I want to have it and you’ll just have to suffer through it… I certainly hope it reads better when the whole scene is in place. 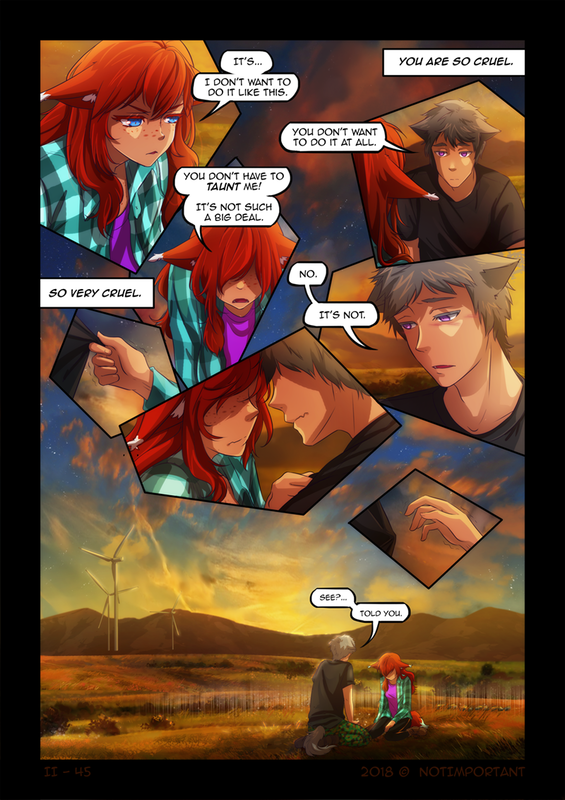 There’s going to be one more page, kind of like an epilogue to the whole thing, and then we’ll move towards new things (although still following those two poor idiots). I think even if you have such a big argument – there will be always the part after where everyone will think about what happened – it might not be the day after, but if the bond between two people is strong enough they will see what they got before them and find a way to overcome these problems in any way. I learned this over the past years with very good friends – and there is never one right side in the argument. And even if they look pointless, they are needed to come back to a zero level. I think you two will see it, because, from what i just got from your tellings you two are getting through this. Personally i liked the whole scene, yes it was long, and the wait for a new page was really hard, but in the end, i think you nailed it how such a “conversation” could go (even with the end bit). And if you are behind, no need to worry, as always (i know, i know), but dont start to rush something, better to take a small break and then continue – everyone deserves a small pause in any way, even if you just want to create a new buffer). Loving to composition of this page and the background of the final panel. Beautiful work. I don’t usually post on pages like this but I just want to say that I think you did a fantastic job with this entire scene, both with the writing and the art. One rarely sees emotional arguments written with such nuance and drawn with such power. That’s very kind, thank you so much! This is the first time I’m commenting here since I found this comic about 3-4 months ago. After reading your text below the page (which I love that you take time to write even though I understand that there is not enough time for a novel every time) I felt that I just had to say exactly what anotherGuyOnTheInternet said. So I guess I’ll just say +1 to him. Greetings from a part of Sweden with a little snow btw. Good. Called her out on it. Now, at last, they can move forward. @Not Important, it was a hard scene, but I definitely didn’t get tired of it. I was eager for it to be over/resolved (? ), but it was good. Our discussion may have felt discouraging, but this scene was very real and well done. I hope things work out with you and your fiance; arguments with the people we love are never fun, exhibit A in these past several pages. However, they are often necessary for personal growth and sometimes a deepening of the relationship. And thanks! I’m really glad to hear that it wasn’t all that bad, a huge relief! Now don’t get me wrong: I’m not claiming that “talking things out” will solve everything. Far from that: there will always be some unresolvable value conflicts, that mandate a certain level of acceptance… However, the better you understand these unresolvable conflicts, the less unnecessary drama they should cause. It probably doesn’t help either that I post a fragment of discussion once a week hehe… I hope it’s more understandable once it’s completed. And tell you what, I think social people don’t get other human beings either but they are better at assuming things. The emptiness in Robert’s eyes in the second panel is very well done and the final shot of this page is absolutely gorgeous, thank you for this great comic. Well that seemed largely unnecessary of Robert. I agree with Laura. If Ada wanted to bone him, it would have happened years ago. He needs be more mature and understand that having a close friend like Ada, who cares about him a lot, is actually pretty great. And not toss it in her face because he can’t sleep with her. They are talking about having their first kiss as I read it. Try re-reading a couple of pages. On the previous one he dared her to “give him a stupid kiss” if she wants to claim that she loves him. I guess one aspect is pretty clear now: apparently, all this time, she has been *saying* that she is interested, in some vague terms; while at the same time entirely refusing to act on it. Although the second option seems far less likely, I’m nevertheless tempted to give it some credibility: her aversion to getting physical seems just too strong for a “mere” lack of interest… It seems to me that without a more fundamental problem with intimacy at play, she should be able to play pretend at least up to some point. He really shouldn’t. Not if he respects her as a person with an own opinion. I really didn’t like the way she said that she makes a sacrifice to let him be with someone else, but she made one thing clear. She doesn’t have romantically interest in him. Oh it’s fine, some scenes require time. Maybe they will run across the sandwich again when they go back to camp after they’ve been to the cabin. Something is just not right here she is holding something back. I have known girls who string you along and such but this does not feel like that. It’s more like she is preventing herself from acting on her true feelings for some reason. I thought maybe she knows she has to be a virgin to use magic or something but that does not track cause why would she not just tell him so and stop torturing him. But still nice job here man you really make the emotions feel real which is something not many artist can do! Woohoo thanks! It’s awesome that it’s working 😀 Thanks a lot for commenting and letting me know, this is really motivating! Recently found this comic. I’m really enjoying it! You are definitely one of the better artist and storytellers. I applaud you. This scene has made me so angry at them… but don’t worry NI, that’s not a bad thing! That’s exactly what an emotional “romantic troubles” scene like this should do! A good story gives you strong feelings toward the characters, and those feelings shouldn’t always be good ones or else the story would be boring. Great job as always! don’t say you are making a sacrifice when you cant even bring yourself just to tell him that you don’t love him like that or just kiss him on the cheek or something. Well, she told him that she loves him in a different way… Doesn’t that kinda amount to the same? I’m still confused what point exactly he is trying to make. At any rate, I think a kiss on the cheek would be rather ridiculous in this situation? I feel bad for Robert. No, I don’t think this scene has gone too long. This has been the most interesting part so far! I have been wondering about their relationship since the beginning. This will change things between them. The tangle of emotions needed this time to expressed. Seconded, it’s worth the time. We can go back and re-read it once it’s completed to get the full effect. So… Did they kiss? It’s really ambiguous as to whether Robert is saying “Told you” as in they just kissed and now he thinks she really has feelings for him, or she didn’t and he thinks she was lying about loving him the whole time. Honestly Robert is being quite childish regardless, you can’t help how you feel, but you can control your actions and this is pretty much textbook male entitlement. Robert is saying told you that she doesn’t feel what she said she felt because she can’t bring herself to kiss him. I’m with you that Rob isn’t really handling this very well and isn’t behaving in a way that someone who has unrequited loving feelings for someone should. Seriously, I don’t see how this is related to entitlement at all. He’s not saying, “I deserve a kiss no matter how you feel about it”. He is saying, “prove that you feel the way you claim you do”. While I think he is probably oversimplifying things, and his “experiment” doesn’t really prove much, that’s not a matter of entitlement. While his idea of “kiss for prove” seems kinda narrow-minded, I still don’t see how that’s an expression of entitlement. I think you are misreading these events. Robert never says (or otherwise indicates) that he “deserves” an intimate relationship with her. On the contrary: he actually says he can live with his feelings being one-sided — all he is asking for, is that she stops giving him false hope. As for Robert proving his feelings, this is simply a non-issue here, since they aren’t ambiguous to either of them in the first place. And then she uses a spell to make him forget the last hour.